Yesterday I added calendar “date selectors” to many of the places you can enter dates into LibraryThing. The selectors are optional—you can always just type instead. But they may come in handy. And get a date selector. Along with this, and along with the recent export improvements, a number of important long-running date bugs have been closed. We look forward to help identifying and squashing what remains. Technical note: We used jQuery UI’s datepicker. We’ve just released a new and improved export feature. Check it out here. Export filtering. 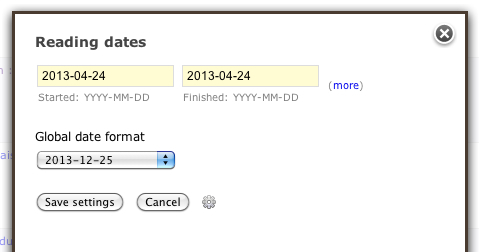 So you can export only books added since a certain date, books with a certain tag. You can also use the new search syntax to control your export even more precisely. More fields. The new tab-delimited and JSON fields now include 41 exported fields, up from 16 or 29 in the old export formats. Essentially all book data should now be included in the export. Richer fields. Flat files, such as tab-delimited text, have a problem with “multidimensional data,” such as secondary authors and their roles. 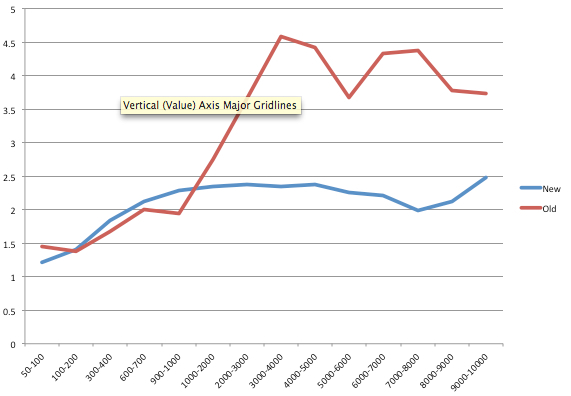 The new format attempts to represent this data more completely, separating sub-values with pipe (|) characters. JSON format. 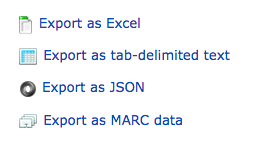 Export is now available in JSON format, a lightweight data format much used by programmers. Better MARC options. We’ve improve the MARC options, for members interested in exporting to a library-industry system. Not being partially broken. Always a good feature! Try it out. Go ahead and try out the new export. Discuss. Come discuss the new export features on Talk. UPDATE: We’ve added an explicit Excel format. * Who is Ammar? Stick around, we’ll tell you soon. 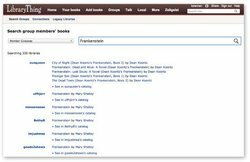 Back in September, we debuted the beta version of a new “Your Books” search system, based on Elasticsearch. 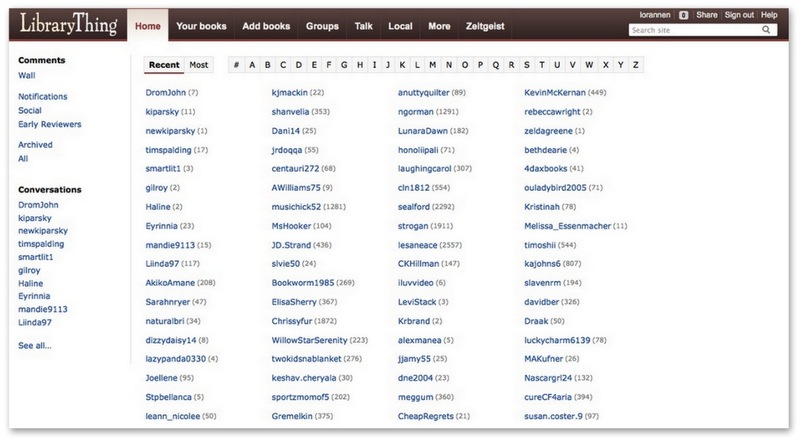 The new Your Books search has now replaced the old, and it’s live on the site for all members. 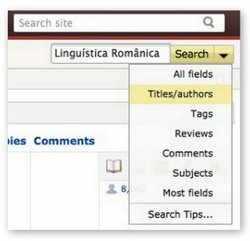 No more “reindexing” process—you’ll never see that green “loading” bar when searching your books again. It handles accents and other “special” characters much better; you can search for “resume” or “résumé”, etc. Searches are echoed back with fields and operators specially marked, so you can see if the system understood the search as intended. Hyphens are normalized, meaning a search for “science-fiction” will return the same results as “science fiction”. The system allows for “stemming,” so a search for “automobiles” or “singing” would also return results for “automobile” and “sings”. You can see which fields are stemmed and which are not here on the wiki page. For a full rundown of the advanced syntax now at your disposal in Your Books search, see the wiki page. There, you’ll find lists of all operators you can use, fields you can search directly, etc. You’ll notice that, once you’re done with a search, the same ‘X’ the upper-left of Your Books will clear and remove your search. Next to that ‘X’, you can now see the full details of your search, written out as it was interpreted. So, a search for tag:history AND NOT art should display Search: tag: history AND tag: NOT art. We’ve also extended our new and improved search abilities to searching the books of your fellow group-members, your connections, and Legacy Libraries. Wondering who in our Legacy Libraries shares your love of The Hobbit, who else in the 75 Books Challenge is a Frankenstein fan, or who among your LibraryThing Connections has a copy of Ivanhoe you can borrow? You can find all three of these on one page, here, where you can switch between them using the tabs at the top of the page. As mentioned above, new search is now live on the site and has fully replaced the old. 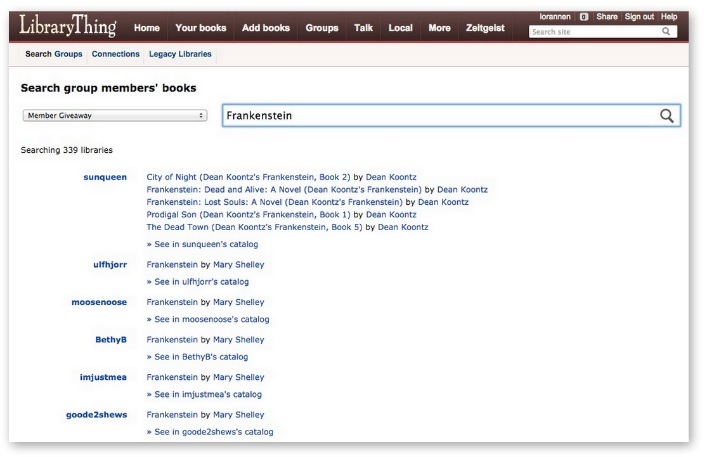 Your Books search should be working much more smoothly and efficiently now, so let us know what you think! If you’re having any trouble, feel free to post your questions in this Talk topic. We’d like to thank all the members who’ve been testing the system, but especially the clever and indefatigable bnielsen. 1. Dewey Wording I’ve added a column for “Dewey Wording,” bringing the textual descriptions of your Dewey numbers (a.k.a. DDC, MDS) numbers into the catalog, if you want them. To get it, Edit your styles or click the “cog” (i.e., ) on the style control (i.e., ) within your catalog. All the wordings are clickable, and like clicking a DDC number, they take you into the (awesome, but not often known-about) DDC mode. 2. Faster LCC/Dewey Sorting. Sorting your catalog in Library of Congress Classification (LCC) or Dewey (DDC) is now faster for large libraries. Here’s a speed breakdown. 3. More sorts. You can now sort by three new fields: Private comments, LCCN and OCLC Number. See also the Talk post about these changes. Today we’re unveiling a major upgrade in how LibraryThing handles comments. » You can skip all this talk and just see your comments page now. Real conversation was nigh-impossible. Messages “lived” in two separate places, with Person A writing on Person B’s profile, and person B replying on person A’s profile. Context was non-existent. Everything was a comment—real comments, notes to people looking at your profile, system notifications, Early Reviewer notifications, etc. Administration was a pain. There was no pagination, making some profiles unwieldy and slow. 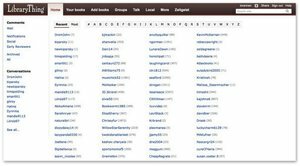 Members “archived” messages to get them off their profiles. Comments now have a dedicated page, available from your profile and on every page. You can now see “Conversations” with other members–a view of all the comments you’ve sent back and forth. 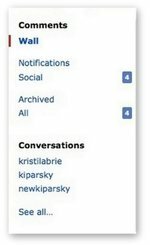 The member names that show up immediately below “Conversations” on the left-hand menu are your most recent conversations. The left of the comments page shows recent conversations. Clicking “See all…” shows a rather complete overview of all the conversations you’ve had on LibraryThing, sorted by recentness or “most” (which conversations have the most comments). You can also see conversations by the first letter of a member’s name. Replies “live” where they’re posted. Replying to a comment left on your “Wall” will both notify the other member of your reply, and also keep the two (or three, etc.) messages together, in context. Your comments are split into your “Wall,” system notifications and social notifications. We’re going to be doing more with notifications, now that we can separate them from your “real” messages. 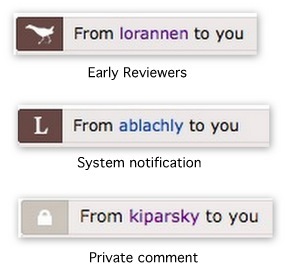 Early Reviewers notifications are separated out too, if you’re an Early Reviewer. Everything is paginated, so the pages are small and you aren’t scrolling forever. Comments now allow Touchstones to works and authors, so you can type “[The Once and Future King]” or “[[Mark Twain]]” and it will turn them into links to that work or author. Your “Comment Wall” still lives at the bottom of your profile. You can also get to your comments page from anywhere on LibraryThing by clicking the number in the upper-right corner next to your member name. When you have a new comment, that number will have a yellow background. You can also reach your comments page by going to http://www.librarything.com/comments. In addition to separating out actual comments from system and Early Reviewers notifications, which each have their own , we’ve also added some header icons to these messages, so, if you’re looking at “All,” you’ll know right away what kind of comment you’ve got. Below is a look at the “See all” page, which, in this case, gives you an idea of just how many conversations I have going. 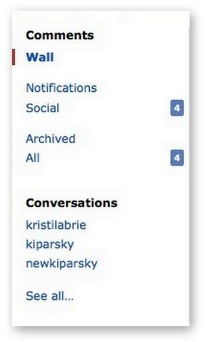 You can sort by most comments in a conversation, most recently updated conversation, or alphabetically by member name. We’ve already got a lively discussion going on Talk: New Comments System. I’ve added a new feature for members to help improve the quality of LibraryThing’s automatic recommendations. It mirrors something we did for author recommendations. This time it’s for works, addressing those times when you see a bum recommendation, or spot a book that’s too low on the list. You can find the new “Rate Recommendations” feature in the “LibraryThing Recommendations” section of work pages. Click on “Rate Recommendations” and you get the expanded “rating” view. In addition to appearing on work pages, I’ve also made a page for members to rapidly peruse their works’ recommendations, and chime in on them, without going work page by work page. It keeps track of how many works’ recommendations you rated, among other statistics. Here’s the Talk post about it. Come tell us what you think! (1) It’s the same system as five stars, with half stars. Indeed, that was the original system for the author recommendation rating. But we decided it was too much like rating the book. (2) At present, we’ve giving it a lot of power. This will probably be reduced. Either way, there’ll be factors other than the mere presence of a rating at work. LibraryThing members have banded together to add all known “Little Libraries,” including Little Free Libraries®, BookCrossing Zones™, the Dutch project “Minibieb” and others to LibraryThing Local, LibraryThing’s index and map of over 87,000 bookstores, libraries and other bookish places. Members have already added 749 of them. A slew of new features supports the project. A long-time member, SqueakyChu, recently requested that we add Little Free Libraries (LFLs) to LibraryThing Local. Apparently the LFL people have been unable to keep up with all the new libraries, and have fallen months behind. Their own map is also limited compared to LibraryThing’s robust feature set. And having LFLs in LibraryThing Local would allow LibraryThing members to discover them, as well as users of our Readar iPhone app. If you don’t know, Little Free Libraries is a grassroots movement sweeping the country and the world. “Stewards” build or buy them, set them up somewhere, often in their front yards, and fill them with books. Visitors take and leave books as they wish. BookCrossing, around since 2001(! ), is a similar concept, encouraging and tracking the free exchange of books from reader to reader. Books can be released “into the wild” anywhere, but “BookCrossing Zones” (BCZs) are special spaces set up to facilitate this exchange. We’ve discussed similar efforts before, and approached both organizations for a feed, without success. We’d love to work with either or both, and will (of course) share our data. But we’re not going to wait. We want people to know about these great projects, and all the other informal sharing libraries out there. So we jumped in. Before releasing it, we had our “Board for Extreme Thing Advances” group to work on it, and they added almost 700 venues, and worked out all the conventions we needed. Adding a new venue allows you to choose “Little Libraries” and the type of library. Venues can belong to multiple types—for example a combined LFL and BCZ. How do I add venues? We’re still figuring out how to find and add all official and unofficial zones. If you’re interested, join the conversation. “Little Libraries” is for small collections of every type, not just book exchanges. The Dutch projects MiniBieb and Boekspots are closely analogous to Little Free Libraries, so they fit. But, as I’ve written before, cities and towns throughout the world are filled with such collections, from coffee shops to churches, from community centers to advocacy groups. At present we’re focusing on fully “public” venues, but the many types available to choose from means it can all go in, with suitable filters for what you want and what you don’t want. Come Talk about this project. Our developers have made a whole slew of improvements recently. If you’re not following New Features, you may have missed them. Here’s a roundup. The person who normally draws our yellow arrows died. We’ve added “share” buttons to the add books page, so you can share your new books on Facebook and Twitter easily. Come discuss. Change your default date format. You can now edit the way you’d like dates to appear in your catalog for the date-read, date-acquired, and entry date fields. 2013-04-26, or “YYYY-MM-DD,” is still the default, but you can change it to M/D/YYYY, or “January 1, 2012,” or several other display options. Change this setting on any book’s edit page, from Edit your profile > Account settings, or in the lightbox which appears when you edit the reading-date fields in your catalog. “Imprecise” or “fuzzy” dates. Rather than having to enter a full year-month-day (2012-12-23) date, you can now just enter a year and a month (2012-12) or a year (2012). Non dates and bad dates. You can even enter non-dates (“Banuary 2012″ or “Sometime in college”) and the text will save and stick. It will, however, be displayed as red text. Dates from before 1970 now save correctly too. New lightbox for editing dates. Editing reading dates from within the catalog now works slightly differently: if you double-click one of the reading date columns you’ll now see a lightbox appear, and you’ll be able to edit any reading dates for that particular book. “Reading dates” catalog field added. We’ve added a new “Reading dates” field to Your books: this uses two columns and includes both the “Date Started” and “Date Finished” reading date fields. It sorts by the latest date in either “Date Started” or “Date Finished,” which is usually what you want. Add this to one of your display styles at http://www.librarything.com/editprofile/styles. Back-end changes. These improvements required various important back-end changes, basically completely revising how and where the date-read data is stored. These were important not only for the improvements mentioned here, but also as we move into more changes to the “currently reading” structure (coming soon). This is step one of a multi-step process. Questions, comments, bugs to report? Come discuss on Talk. By popular request, we’ve adding a way for you to view or sort by a work’s average rating in your catalog. The column is called “Work: Average Rating.” Add it to one of your display styles at http://www.librarything.com/editprofile/styles. The column shows the work’s rating graphically (with stars, making it easy to compare your ratings with the average) as well as numerically, to allow more precision. The total number of ratings is also displayed. For more on this, see the Talk thread. Over 250 members voted on how to style it, and we ended up coming up with a compromise. Importing is much faster. You should see a marked increase in speed when it comes to processing imported files: we’ve dedicated some more processing power to handling imports, and made some speed improvements in the queue-processing code as well. Syncing. You can now sync between Goodreads and LibraryThing accounts, allowing you to periodically update your LibraryThing library from your Goodreads account. Synced fields include reviews, ratings, date read and shelves/tags. There were a number of issues with imports from Shelfari, Anobii, and Calibre that were causing all sorts of strange things to happen. Imports from those sites should now be much more successful (author names should come in completely, for example, rather than partially as they were in many cases). A bug which caused collection assignments to go awry was eliminated. Books which only include an ISBN-13 are now imported using the ISBN, rather than as ISBN-less books. We’re now blocking any records without any data in the title field, as well as any blank rows in the imported file, from adding as blank LibraryThing book records. Better tracking. During this process we added a number of new and very useful tracking measures on the back end so that we can monitor imports in a more coherent way and help to troubleshoot bugs much more easily. Need to import? Head over to http://www.librarything.com/more/import and add or sync your books. As a first step in the direction of a site redesign, we’re working on standardizing various elements of the site, so they all look the same across LibraryThing. We’ve begun this process with the “left nav”—what we call LibraryThing’s secondary, left-aligned navigation menus on Talk, Groups, Recommendations and lots of other pages. Basically the code for these was the same, but a whole bunch of differences cropped up depending on which page you visited. We’ve now standardized these based on the version previously used in Talk, with the addition of a blue “call out” bar by the item you’ve selected. UPDATE: See below for some new privacy controls we’ve added. 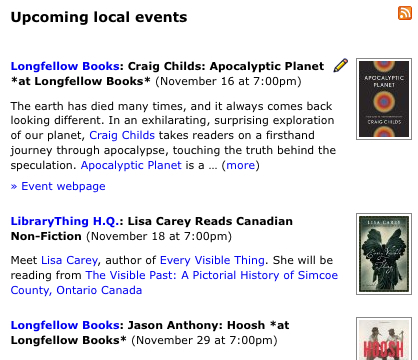 LibraryThing has long had a way to mark your favorite bookstores and libraries from LibraryThing Local, LibraryThing’s database of more than 80,000 bookish venues and 60,000 upcoming events. Today we’ve added a way to mark places you’ve visited—in general or, by a simple “check in” button, the day you visit somewhere. You also get new lists of where you’ve been, and maps. Here’s what the new visited options look like on a venue page. By default everything you mark as favorite is also marked “visited.” But you can un-click “visited,” if a place is a favorite but you haven’t visited it. You can see my list of visited venues and my large map. They’re a work in progress, but it’s liberating to be able to record all venues, not just those I want to mark out as special favorites. Let us know what you think, report bugs or suggest improvements on Talk at New Features: Mark the bookstores and libraries you’ve visited. 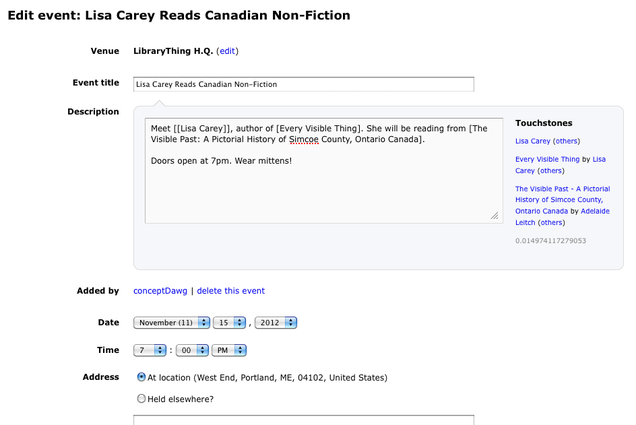 We’ve been making some changes to how events are added and displayed in LibraryThing Local. The big change is a simplified way to add events: the old system, involving picking authors, picking books and characterizing the event (“X reads from Y”) is out, replaced by a simple description box, but with the ability to add touchstones, just like on Talk. The goal is simplicity. The new interface requires less—some people will just paste descriptions in. But events are primarily about what’s going on near you, not finding out where in the country so-and-so is speaking next month. If you use touchstones, however, it creates the links and puts the events on the author’s LibraryThing page, which is handy. Come discuss in the Talk thread. And finally (though there’s more coming soon! ), there’s now a way to filter out events you don’t want to see or aren’t interested in (by author, store, or keyword). When you mouse over the event, clicking on the “x” leads you to a list of options. Basically, you can filter out the event, the venue, or any events with certain words in them (eg., “storytime”). You can set your event filters at http://www.librarything.com/editprofile/local (the “Local” option under “Edit profile and settings.”). Come discuss here. Stay tuned for some more news on LT Local and events soon!